Early childhood is defined by acute sensations (the discovery of the way in which the senses, constantly awakened and stimulated, allow to map the world), and by the acquisition of language, which may be smooth or problematic. As they translate sensations into words, infants are faced with a tremendous series of tasks and challenges: they must identify sound sequences as words, units and sentences, then learn how to map words onto objects, sounds onto feelings, urges, demands. Words may allow them to make sense of the world, or complexify it beyond understanding. 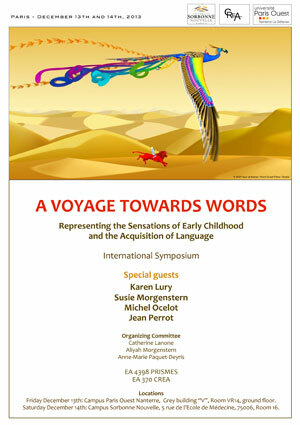 This “Voyage Towards Words” aims to bring together linguistic, cinematic and literary approaches, in order to probe into the creative processes at work, and to study the way in which sensations are part of the process of discovery, allowing to grasp the world, to remember defining moments and shape experience into language.